Thanks for stopping by! I hope you'll find these stories inspiring and encouraging as you plan your wedding and marriage. I am so excited to share with you another installment in my summer vendor spotlight series! 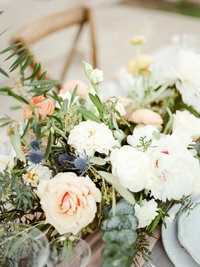 We’ve been chatting with some of my favorite Dallas and Fort Worth wedding planners, florists, makeup artists, and calligraphers to find more about who they are, what they do, and how they love and serve their clients so well! I’ve loved getting to know and work with all of these talented women and I’m so thankful to call them friends! These gals are at the top of my recommended vendor list to my clients because I trust them 100% to be professional, fun, and amazing at what they do. Shannon and I met at a networking event a little more than a year ago and bonded instantly over our love for Dave Ramsey. We both went to his conference in Dallas that happened to be the next day and have been friends ever since. I love how on top of everything Shannon is, even having a little kiddo running around! She’s so fun to talk to and you just know you’re getting a pro when she gets down to business. Time to hear from Shannon! Tell me a little bit about yourself and how you got into the business. I am one of those people that loves to talk and get to know everyone I meet and I am obsessed with checklists and details. I have a large personality and even bigger work ethic. I grew up in a small Texas town called Red Oak and graduated with a bachelor’s degree in architecture from Texas Tech University in 2010. I was having trouble finding a full-time job in architecture because of the economy at the time. I have always been the type of person that can’t stand doing nothing, and event planning was something I had always had in the back of my mind, so I found an unpaid internship with an event planning company in Dallas. I knew I wanted to do event planning full time when I could not sleep the night before an event because I was so excited to get to work the next day. The crazy thing is I was not even getting paid (It was crazy I was driving one hour to her office and one hour back through $10 tolls and working 10-16-hour days and still loved every minute of it without making a dime). To be honest, I really don’t know exactly why I decided to start my own business. It just felt right at the time. After my year internship ended, I started working for an architecture firm thinking maybe I wasn’t being realistic, and I was miserable working (55-60 hour weeks and not enjoying what I was working on) and my husband (a business owner as well) asked me, “Why are you working all these hours working for someone else? It is obvious you are meant to own your own business and do something you love.” I decided to save money and just do it. It was as simple as that! What is your favorite part of your job? Why do you do what you do? What gets you up in the morning? I love the fact that I get to help make people’s dreams come true (and yes I know that sounds cheezy! ), but I honestly get to be a part of a moment some have been dreaming about all of their lives. It such a great a feeling that not only that I get to help make that dream a reality, but also get to be apart of such a special moment. I think a lot of people think that all I do is go on Pinterest and look at ideas all day and the wedding just appears, but that cannot be further from the truth. Design, in general, is only 30% of what I do. I typically work 10-hour days during the week, meeting with vendors for each client, emailing clients and vendors to go over contracts, quotes, putting out fires left and right, and on the wedding day, it is not always sunshine and roses. Sometimes we have vendors arriving late or not at all, rain when there is not supposed to be any rain, trash left that we end up taking out … And part of my job is not letting the client worry about any of it, and finding ways to fix it, so they don’t have to feel one bit of stress! 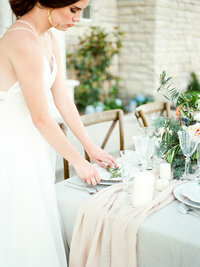 Why do you think hiring a professional wedding planner is so important on your wedding day? 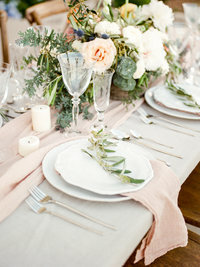 Hiring a wedding planner is so important! I can’t tell you how many times at the end of the night, the mother of the bride, bride, or even the groom has told me “hiring you was the best money we spent!” And it’s because hiring a planner not only helps you stay on budget, take away stress during the process, help your vision come to life just as intended, but also on the wedding day itself. The bride and groom and their families don’t have to worry about all the craziness that can happen on the wedding day. Everyone can just sit back and relax while we make sure everything is set out correctly, the day runs smoothly, and help pack up decor at the end of the night so they don’t have to. Any memorable stories from a wedding day you’d like to share? Honestly, I can’t choose just one, but my favorite moment of every wedding is right before the bride is about to walk down the aisle. It always makes me emotional to see them with their dad or mom in such a special moment, and know that they are about to start a huge new chapter in their lives. If you weren’t doing what you’re currently doing, what would you want to do instead? I would probably still be in architecture or in interior design. Where are some of the places on your travel bucket list? 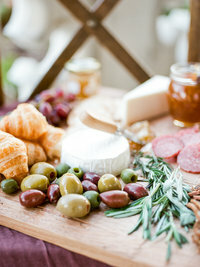 My husband and I are taking a 10-day cruise right before fall wedding season, and we will be going to Spain and Italy! We never took a honeymoon so it is a much-needed vacation for the both of us. 1. I used to be the lead singer and rhythm guitarist in a classic rock, country, and blues band. 2. I am a bow hunter. 3. I graduated in a class with only 17 people. Where are your favorite local hangouts and things to do when you’re not working? I love seeing local bands when I can at the Woodshed or White Elephant, but typically when I have a night off, I am watching movies with my husband and son.